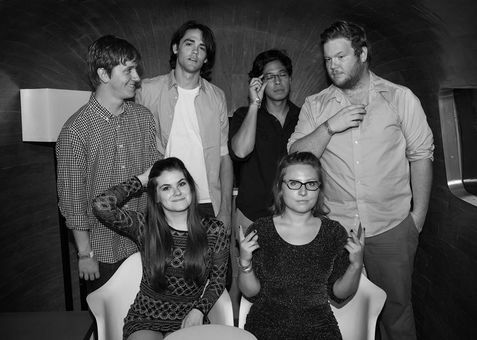 ​Edison Chair is a rock ‘n’ roll band from Austin, TX known for their high-energy performances, catchy songs, and smartly crafted harmonies. The band consists of Rachel Thompson and Ellen Gruber leading on vocals, Martin Aker on vocals and lead guitar, Wes Armstrong on drums/percussion, Wes Ballew on keys, and Jacob Draper on the bass. Edison Chair has developed a sound that will be hard to forget. Imagine a less folky Fleetwood Mac, or the Heartbreakers fronted by Ann Wilson instead of Tom Petty, and you’ll have an approximation of Edison Chair’s sound. Edison Chair honors the style of timeless rock influences, while making innovative strides in the wake of popular modern bands. Martin and Wes A first formed Edison Chair in 2007. Neither of the leading ladies joined the band until several years later, but they have always been fans. "We used to obsess over them like they were actually famous" says Rachel. Their friendship creates a comfortable collaboration that shines on and off the stage.